Rosh Hashanah, the Jewish New Year, is the beginning of one of my favorite, impactful, and challenging times of the year. It is a significant time dedicated to reflection, thoughts for change, memories of the past personally and historically, and commitment and plans for fresh starts personally, professionally, and in local, national and global communities. 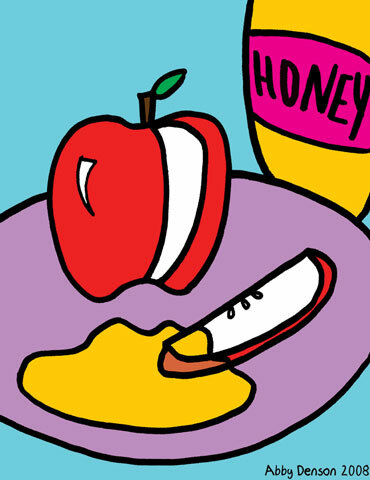 It's also a time for family gatherings, special meals and sweet tasting foods, especially apples and honey. Rosh Hashanah is the start of a ten day period of celebration through Yom Kippur, the Day of Atonement -- a solemn day that involves fasting, reflection and prayers. Somewhat like the world's New Year, which takes place at the start of January, Jewish people commit to resolutions, but don't call them resolutions. For example, wanting to lose weight, quit smoking or start exercising are important life-altering behavioral changes, but on this holiday our commitments run deeper and involve change that centers around righting the wrongs we have done to others, and to ourselves, and to establish new paths for growth, change and Jewish learning moving forward. It's as if we get to the meaning behind how we feel, the anger we have against ourselves and the emotional and physical commitment to make a change. Another example for me would be the importance of teaching Sarah now that she's getting older about Jewish heritage and culture, and to help her learn and understand history and traditions. What I find even more special about this time of year is that it's a chance to look back over the last year, and truly reflect, and see what life has been like not just for us as individuals but as a world, and what has impacted us all. It's this time in the year that many of us identify our accomplishments, which sometimes get dusted under the rug due to the busyness of life. It's time to look at the wrongs we have made and how to make them right. It's also time to learn ways in which we want to get more involved in local, nationwide and global communities to help make a difference. With Sarah approaching the age of four, Daniel and I have a great responsibility to help educate her about Jewish life, traditions, values, and our religion's history. This is where I make my second commitment to learn more about Jewish history in a way that I can help explain it to her so that it ignites discussion and interest. For those of us, where religion is an important part of our lives, it is our responsibility to help guide our children to understand what it means to BELIEVE, have faith and learn that there is a higher power beyond us in which we connect with emotionally and spiritually. Happy New Year. L'Shana Tovah. If one more person tells Daniel or me that Sarah is shy I am going to scream. It's amazing, because the people who say this are the complete opposite of this temperament and; therefore, judging her because she is not as talkative or outgoing as they are. It's interesting to see children be able to sense another person's discomfort. When this happens, in the case of Sarah, she will not gravitate to these types of people, until they become more at ease or stop trying too hard. According to parenting expert Amy McCready, Founder of Positive Parenting Solutions and the author of If I Have to Tell You One More Time (Tarcher/Peguin, August 2011) "we should never label our children as being a certain way." She further emphasizes that by labeling our children they will grow into these temperaments and may strongly start identifying themselves with these traits, when in essence they may not be an accurate depiction of who they are and how they act. Just because a child is not as talkative or sometimes hides behind someone familiar (i.e., mommy or daddy) doesn't fully mean he or she is shy. Just because Sarah may hide behind me on occasion when she meets someone new or hasn't seen a family member or friend for a while does not make her shy. She needs time to adjust, and to process her surroundings. She takes her time to acclimate to the environment around her on her terms and not on the terms of others. As a parent who often worries about the safety of her child for obvious reasons, it's this behavior that I admire much about Sarah. She is cautious and not one to run into everyone's arms with hugs and kisses right away without time in between to settle in and get acquainted. Large gatherings and groups of people can be an overwhelming setting for children, adults too. I think of an experience Daniel brings up every year around the holidays when family gets together for dinners and gatherings. He jokes and says, "at your family's house there could be 10 people and 20 conversations." He's right, as I grin writing this. It's true. What can I say? In instances like this, people like Sarah, and Daniel as well, don't feel the need to be part of the conversation and much rather prefer one-on-one communication in a much more intimate setting. They also don't feel the need to add yet another conversation to the mix or compete for the attention and; therefore, tend to appear more quiet and reserved. Sometimes this behavior is perceived as disinterest by others. Once the playing time begins and another child is involved, then Sarah gets more involved, but on her terms and when she is ready. I have learned not to push her to do anything. I try hard to encourage her to try news things but at the pace that is acceptable for her. As parents, we want to motivate our children but certainly cannot push them to do things they are not comfortable with or which may cause them great stress. Through McCready's Positive Parenting courses and books she provides valuable tips and approaches to help guide parents. She recently sent out an email tip sheet, to her members in which I am one of them, with the following information specifically about not labeling children and the timing was apropos for this blog post. I asked her permission to share that very information here with you. What McCready is emphasizing is that we need to be understanding of our children's needs to help them establish coping skills so they do not feel pressured to step into situations that may cause undue stress or anxiety when pushed. It's certainly important for parents to work with their children, as Daniel and I have been doing with Sarah, to help them gain comfort. We have heeded much of McCready's advice. Practice social skills. Role play talking to people and looking into their eyes. Encourage your child to focus on the color of the person’s eyes, as this makes your child appear more interested and confident. Practice using a “big” voice when you meet someone new and extending a hand for the other person to shake. Practice the words to use when meeting new friends... “Hi, I’m Emily – what’s your name?” Some children don’t feel comfortable in new situations or with meeting new people, but role playing these important social skills can increase their confidence – even for very young children. Don’t rescue. When your child refuses to answer, don’t coax or answer for her. Just continue on with your conversation and trust that your child will jump in when ready. Don’t pressure! If your child feels that you are pressuring him to act in a certain way, it will likely escalate to a power struggle. He may “act shy” just to prove that you can’t “make” him talk. Use Family Meetings as an opportunity to get outside the comfort zone. Kids as young s four can take the role of “Meeting Leader” which offers practice speaking up and taking a leadership role in a safe, comfortable situation. We have to remind ourselves as parents that we certainly don't like others telling us what to do. So, for our children, we need to be extra mindful of this as well for them. Kids don't need to be involved in lots of activities or have an abundance of playmates to have a good time. For those who know Sarah and spend quality time with her know that she is incredibly bright, boisterous, energetic and playful, and more responsive to get involved once she is comfortable. Sarah decides who and what makes her comfortable. What can I say? She knows what she wants. I can't argue that. I just have to be mindful of what makes her comfortable and not assume that she will gravitate as easily to situations as other kids might or as quickly as I would hope. She needs time to adjust. I am not suggesting that we let our youngsters dictate what they want to do and who to do it with but instead to give them the necessary space to keep them comfortable but also with encouragement to get involved, make friends and meet new people. I am always so impressed by how well Sarah can read people and their emotions or feelings. She's extremely empathetic. However, if a person were to try too hard to get Sarah's attention or affection she may be, and most likely will be, apprehensive. Some people have a calmer, less requesting nature that Sarah is more likely to gravitate too. Being with Sarah is an investment in time for her. It's as if her trust needs to be earned. This is not her being shy. This is her being smart and cautious. And, I am very well okay with this. I know that I am being defensive here when I say this, but the more that people call Sarah shy, the more she is going to start seeing herself that way. and I really want it to stop. I need to help make it stop. Daniel and I certainly continue to work with Sarah to help her become more comfortable with people and in certain situations. We cannot force a child to do something they don't want to do, such as hug or kiss someone or expect them to go play with a certain kid or adult when it is requested of them. They have to do it on there own at their own pace. How many times have we as parents experienced the beginning of a playdate or visit with friends or family starting off a bit awkward with our children taking time to get comfortable and settle in to then find later in the visit that it's impossible to tear them away from the fun they are having? Children make their own choices as to what makes them comfortable. As adults, we many times do the same thing. We have to respect that. So, let's please be cognizant and mindful of the next time we see a quieter than usual child or one that is seemingly more cautious and not say he or she is shy. Let's instead give them the space to get comfortable, acclimate and settle in to the situation. Think about how we feel when we go to a party or unfamiliar gathering. Some of us have no problem going up to people to introduce ourselves and mingle. Some of us do struggle with this and sometimes, as adults, need a drink or to see a familiar face to ease into the situation. The same holds true for kids (at least not the drinking part) at family gatherings and big events with lots of people and extraneous noise. So, rather than labeling a child that seems quiet, reserved or who takes time to adjust as someone who is shy, instead give them their space to settle in and get comfortable and they will shine through. 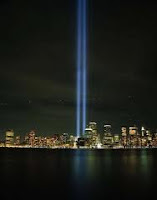 On September 11, 2001, I woke up refreshed and happy after spending the previous evening with good friends talking, laughing, eating delicious eats, drinking tasty treats and reminiscing. The day started off for me as a good morning. I was energized to get to work early and start the day. Never in my life would I have fathomed what would happen on that clear and calm morning just as 8:47am ET struck. After arriving at work early to get a jump start on the day, I heard some hustling and bustling going on in the conference down the hall where the television was on, and went over to check it out. I approached the room and saw that the TV was on and what I saw before my eyes was unbelievable. I wasn't really sure what I was looking at and not sure I was processing well what was happening. I stood there quiet and surprised that no one else was reacting. Not realizing it, tears began falling down my face. It's as if my mind knew what was happening as I saw the smoke coming out of the side of the first tower. However, my heart felt something completely different. I immediately ran to my desk in a semi-panic to call my stepfather, who worked downtown a short distance from the location of the towers, and to confirm that my stepbrother was okay too since his building was on State Street near the towers. Unable to get either of them on the phone I ran back to the conference room where the TV was to see what else was unfolding. I stood staring in disbelief. The words terrorism never entered my mind. It just didn't seem possible. But, watching what was happening before me, it was evident that it was true. I felt naive in that moment thinking how could this possibly be happening on American soil and in the land of the free. While all of this was happening, I was trying hard to keep calm and gain clarity in what to do. All the while, I wasn't sure what to feel or believe. It was then at that moment that the second tower got hit and the building began to implode right before my eyes. Then, the next tower came tumbling down. I am pretty sure I stood frozen with my mouth wide open, gaping while tears streamed down my face even more. I was dumbfounded by what was happening. I stood there in shock. I desperately tried hard to comprehend what was going on, and shocked and numb by the reality of the mayhem taking place in my home city. It really didn't feel real. It just didn't seem real. But, it was indeed real. And, then to hear of the down Flight 93 and the crash at the Pentagon, I felt as if my world was going up in smoke. Struggling to get friends and loved ones on the phone to confirm their safety and trying to stay calm, my colleagues and I wished to get out of the office as soon as possible. Unfortunately, we were not able leave the building as personnel felt that it wasn't safe for us to exit to the street and that it was likely best for us to remain inside until they had confirmation we were not in danger. The panic rose from being forced to stay confined, and as we stared out our windows to see black billowing smoke coming up the avenue and rising high into the sky we became that much more concerned. Again, I tried to get friends and family on the phone and then had some luck. My stepfather, thankfully, who commuted at that time of day to get into the office, was okay. However, his building was not letting anyone leave either since they were in the thick of the soot in the air and there was fear that there could be additional terrorist acts in the area including bombs going off. It wasn't until seven hours later that day that I was able to see my stepfather in my apartment safe and sound that I breathed a sigh of relief. After a few hours in my office building, eventually we were given permission, at our own risk, to leave. And, leave is exactly what I did, what all of us did. I still worried about my stepbrother not knowing where he was, and unable to reach him or hear of his whereabouts. My stepfather was unable to get in touch with him either, at least for quite a while. Fortunately, my stepbrother is well. Turns out that he was desperately trying to get out of his office, walk over the Brooklyn bridge and get as far away from his office building where he saw the first plane circle around before crashing into the tower. As I left my office to walk home, uptown for over forty blocks away, I first walked to my mom's office to get her and then walk her home with me, trying to keep her calm until we saw my stepfather in person. As we walked towards my apartment building, military-style trucks were driving up and down the avenues to and from ground zero carrying large numbers of troops armed with weapons. It felt like we were in a war zone. All I could think was, "are we at war?" The black clouded soot was in the air and the smell of fear was ever present too. The entire day my body felt numb and my eyes sore from crying. All I could think of was how many people could possibly be impacted by what was happening, praying hard that the numbers of people harmed were few. Only so many of my prayers were answered that day as the numbers of bodies that were found in the rubble was exponential. In the days following 9/11 I was able to confirm safety of many friends and family. There were also many with "close call" stories that were blowing my mind. There were a number of people who were running late to work that day or stuck underground on the subway delayed to then arrive to see the devastation of the crumbled towers from the outside of their building. I felt useless to the devastation that my city was experiencing. I felt like I needed to do something to help. It was hard to sit still and not do anything to help. So, help is exactly what I did. To this day, I am incredibly thankful to the company I was working with at the time who gave me, and others, time to return back to work when we were ready. In that time I couldn't sit at home. I certainly could not watch what was happening, again and again on the TV. Instead, I got myself out of the apartment with bags of clothes, shoes and more to help bring to local sites collecting for those in need. So many people were forced out of their apartments and evacuated. I spent time down at ground zero helping to serve food and coffee to emergency workers at restaurants that shut down for business and opened their establishments as mission centrals. I spent days and weeks in warehouses collecting and organizing an incredible number of donations sent by people all over the nation to those affected by the tragedy. People sent clothes, shoes, food, baby items, and even dog food. It actually got to a point where there was eventually too much stuff after it all got rationed out that we then had to coordinate getting it donated to shelters and other places. September 11 will forever be a part of me. To the people who lost their lives that day and to the many families left with the loss of their loved ones my heart goes out to you. I thank G-d everyday for life, allowing me to breathe air and to have my loved ones here with me not taken by this terrible travesty. Now, I have a responsibility to share this important day in our nation's history, take action to continue to help others and be thankful for what I do have and the people in my life who are here to experience it with me. To those who lost their lives and to the families who continue to grieve, my heart goes out to you and I wish you peace and strength, if that's even possible. Your memory will live on forever and you shall never be forgotten. I am now at the ripe age of 40, entering a new decade and have not been very welcoming or embracing of this new age, this new change. I know it's just a number, but it's more than that. Part of this feeling may have something to do with me being a woman who feels her biological clock is still ticking with the desire to potentially have another child, and whether to try to conceive or adopt one more. It's a conversation Daniel and I have had several times, and one we are still discussing. There are a number of extraneous variables that have put this desire to expand our family on hold. I will say this, and do recognize, that the more energy I put into not liking my new age the less time I am spending on embracing it, enjoying it and continuing to live it up without feeling down about getting older. There is so much that I have to be thankful for in my life. I have a great deal to be happy about, and not just this year, this birthday. I am really, really fortunate to have met my husband, my best friend and life-long laughing partner. Together, we have also created the most amazing, funny, hilarious, exhausting and lovable child. We are also in the process of buying a home to settle down and establish roots. I am very fortunate to have wonderful, loving and supportive friends and family. And, I am also in good health, at least for the most part. I am pretty sure that I might not be feeling this way, or as strongly, if I didn't gain too much weight this past year likely due to stress and changes in about every aspect of my life including a quick move to a new city, finding and changing schools for Sarah, finding and renting a place to live in, and overall, adjusting to new schedules and way of life (driving versus walking) living in the suburbs. I have no good excuse why exercise has fallen off my radar. I know that I have it in me to lose the weight and have done it before and felt fabulous. By taking action to control my diet and add in regular exercise I can become fabulous and forty. That, I like. That I would like to strive for. FABULOUS AND FORTY. I can choose to stay stuck in a rut complaining about my age or I can accept that clearly I cannot change that but instead to move one foot in front of the other to get more healthy, so vitality is not a question, and continue to live life fully. So, today I declare that I am 40. I am happy to have the life I have with the people in it, my friends and family, who make it incredibly special, and who matter most. I am going to put my energy into appreciating life that much more without the thought of my age but instead on the accomplishments and experiences I have been fortunate to have to date. Instead, I aim to look ahead to all the wonderful opportunities and experiences that are my future and establish a new plan of action with great emphasis on the life I have now and what I want it to be. My birthday present to myself, in addition to the Ricky Martin concert I treated myself to this year, is to take charge, start fresh and move forward with passion, energy and enthusiasm make the most out of the life G-d gave me and do the most with it with great impact. After writing a previous post entitled Labor Day: Time to Play and Relax I realized that I failed to acknowledge that there are many Americans not able to play and relax this holiday weekend as they are experiencing stress because they are out of work and unable to find jobs with their skilled backgrounds due to our volatile economy. This day for the many unemployed or freelancers struggling to keep a regular flow of work coming in, it's a constant struggle to stay afloat. This is a challenging place to be for anyone, not just people with children. It's even more scary the state of our economy as the skilled and college educated too are losing their jobs and sometimes having to completely ditch their fields of expertise for jobs in other areas to generate income to pay rents or mortgages. In many of these instances, the income that is now being paid to these experienced individuals is much less than what was previously earned. I know this from personal experience as my job, and department, a few years ago just a few months after having Sarah was streamlined and many of us lost our jobs. Fortunately, I was offered an opportunity to remain within the parent company and join the sister agency while still working on projects for my previous agency enabling me to remain within my skilled area and take on some new responsibilities. However, my income was decreased by twenty percent as I shifted to a four day work week. At the time, with a newborn at home, I was thrilled to have more time with her; however, the reduction in income certainly was felt. I became extremely more conscientious of how money was being spent. At this same time Daniel was the victim of his company merging with another and then became a product of many senior staff being skimmed from the top. This led Daniel to proceed with a career as a freelance writer and journalist maximizing all of his personal and professional relationships to do his best to keep income coming in while continuing to further his existing skill set and expanding reach into other areas to grow his expertise. The latter was especially important and fortunately valuable. Three and a half years after he began freelancing Daniel recently land a new opportunity with one of his freelancing clients. Due to the nature of the economy sometimes we have to make difficult and different choices and take action to find new opportunities. For Daniel, it took years after being laid off and continuing his work as a freelancer which led him to his new job. For me, I had to experience what I went through to realize that what I wanted most was to be near family in a new city and to find a new career opportunity. Thankfully and happily, I was extremely fortunate to get both of my wishes and now in a job I enjoy doing what I am skilled at and in a new city I call home near family and making new friends and establishing roots. This economy has taught many of us that we need to be thankful for what we do have and to make the most from it. And, that sometimes we need shift our focus to different jobs or careers. Further, it's important to realize that it may take time and other experiences before finding a job or career that suits us and that we need to be patient and understanding in between. So, on this Labor Day I want to acknowledge all of us who have been impacted by the volatile market we are in and to try to have strength to find within what matters most to us and to embrace opportunities that come our way and to consider new paths and directions that may actually get us closer to where we really want to and ought to be. Ten years ago, while living and working in New York City, six months before first meeting Daniel and four days after my thirtieth birthday, I thought the world was going to end. I know that this sounds dramatic. But, I was there that dreadful day in New York City when the famous Twin Towers came crashing down and my home city was up in smoke and in mayhem. I was there praying for friends, family and strangers to be safe and helping others to grasp and move on. At the time of the 9/11 tragedy I had just approached a new decade in life, still being single and feeling as if the world around me was crumbling, literally in the case of the iconic Twin Towers, and figuratively, trying to determine what would come next for me in life. It's hard not get choked up or get a lump in my throat remembering that time when the streets of my home city were flooded with candles, flowers and countless posters of faces staring back at me of the missing people in desperate need of being found. Now, ten years later, as I enter a new decade, I remind myself of how truly blessed and thankful I am. I am also incredibly appreciative to not only breathe air but to have found love, grow life and develop a family of my own. It's just a hard time of year, not only as I usher in a new birthday, with this one being a milestone, but with it comes a heavy heart and constant reminder of the pain and suffering my city, our nation, and the world experienced, and wish for peace. I know the day will come, years from now, when Sarah will be old enough to learn about what happened on 9/11. While I know that that conversation will be an extremely difficult one to tell, I fully intend to share with her my experiences and powerful lessons that came from that life-altering day. The biggest lesson of all that I intend to share with her is to not take for granted the life we have been given and what we can do with it. It's not to say that we can't feel sad or upset. But, this experience of 9/11 is a reminder to take stock of what we do have, family, friends and loved ones, rather than assets and materials things. Instead, it's a time to reinforce the importance of surrounding ourselves with people to love and be loved by and to take each day as a gift and get as much life out of it as we possibly can. In memory of the thousands of lives lost, and other lives impacted by 9/11, I want to share the following Haiku poems. I can't believe that the summer is nearly over and that Labor Day is just a few days away. It's been a busy year indeed, and I look forward to, when and where possible, to relax as much as I am able to this weekend during family time, play dates, a friend's wedding and time in between. As a mommy, I can't help but also be brought back to that amazingly long, exhilarating and exhausting day, which I wrote about a while back here, when I labored to have Sarah. Don't worry, no graphic details included. The sun shines brighter with Sarah in my life. Her smile is infectious. Her giggles are precious and keep me laughing. Her wit, charm and overall boisterous and playful personality keep me going day to day. It's no wonder that I went through a full day of labor, two epidurals and an emergency Cesarean section to have Sarah, as she is indeed a spit fire and spark in life and nothing with her is a dull moment. Why should labor and delivery have been any different? So, as I think of the labor of work, life, and parenting let's take a moment to relax, if possible, and breathe. I hope for all of us a weekend of ease, comfort, fun, play and joy, and likely alcohol and good food to consume. And, since some people have to work on Labor Day, let me instead say, Happy Labor Day weekend!! !